Dank, dark, underwater and rusting. What's not to like? Flooded Titan missile silo dive - both the claustrophobic and aquaphobic should look away right now. Connoisseurs of cold war rust may look on with horrified interest. I can't see my house from here! Hua Shan cliffside plank walk - the acrophobic amongst us (myself included) will enjoy this one. Apparently, it was traditional to ascend Mount Hua during darkness - it being considered safer to climb when one couldn't see the horrifying drops beneath. Also enjoy - bonus nightmare fuel from Spain. 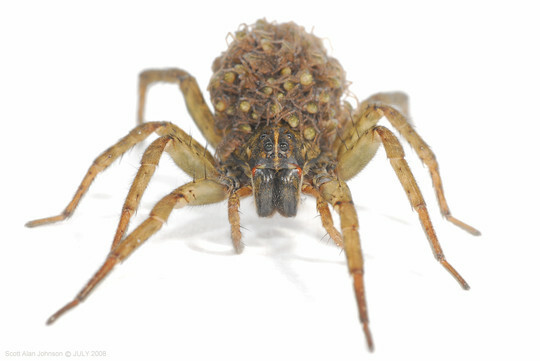 Wolf spider with young - the arachnophobic may enjoy this fine example of a spider ... covered with more spiders! Cyriak's nightmares must be ... interesting. Cows & cows & cows - apparently bovinophobia is a thing. If you're a sufferer, congratulations on choosing the wrong blog to follow! Bonus Martian Robot corner - if you missed yesterday's article update, please find linked an unofficial interactive panorama of the MSL Curiosity Mars rover! What is the fear of suffocation? 'Claustrophobia', disappointingly. But what about suffocating on vast, desolate alien landscapes? Cosmonauts of the future need distinct terminology! THE FORM OF THE DANGER IS AN EMANATION OF ENERGY. THIS PLACE IS A MESSAGE - AND PART OF A SYSTEM OF MESSAGES. PAY ATTENTION TO IT.